Hanging Tongue Syndrome is a condition where a dog’s tongue hangs out of his mouth all the time and the dog is unable to bring her tongue in at will. This could be due to the dog’s breed, a mouth or jaw injury, or deformities of the mouth or teeth, among other things. Other times, things like medications or the removal of teeth could temporarily leave your dog’s tongue hanging outside of his mouth. If a dog is not able to moisten her tongue by bringing it fully into the mouth, then the tongue could become dry or cracked over time and cause the dog some pain. If your dog can’t or won’t bring her tongue inside her mouth to moisten it on occasion, then you need to take a few extra steps to care for your dog’s tongue. Only your vet can accurately determine whether your dog has Hanging Tongue Syndrome or not, and whether she is in pain from it or not. Routinely encourage your dog to drink water. This will help to lubricate the tongue and mouth. Apply a few drops of water directly onto your dog’s tongue throughout the day. In rare instances, a dog’s tongue may need to be surgically shortened in order to alleviate further problems. Take the time to regularly inspect your dog’s tongue looking for changes in texture, color, size, or bleeding. If you notice any of these things, take your dog to the vet right away, because they could signal deeper issues — such as an infection or neurological problems. Too much time in the sun could lead to a sunburn on your dog’s tongue. Too much time spent outside in the cold winter months could lead to frostbite on your dog’s tongue. 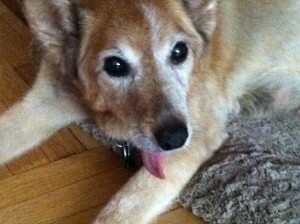 Why Is My Dog’s Tongue Discolored? Is This Hanging Tongue Syndrome?